The RealTime Acura team knew it was all on the line when they left Wisconsin for the sunny skies of California for the SCCA Pro Racing SPEED World Challenge Touring Car Championship finale at the Monterey Sports Car Championship. It is under pressure that the RTR boys work best and they responded with a spectacular end to the season. Pierre Kleinubing led the team in his No. 42 Acura TSX with a pole-sitting start, and never gave up his first place position to take the pinnacle of the podium. Team leader Peter Cunningham, in the matching No. 1 machine, was hot on his heels and finished second, just 0.610-second behind. With this win, Kleinubing’s second for the 2009 season and his 29th overall, he clinched the Drivers’ Championship and helped to lock in the Manufacturers’ Championship for Acura and the RealTime team. This was Kleinubing’s fifth win at Monterey, perhaps his most sweet victory yet, because of the team significance. "I didn’t know Championship scenarios, but everyone else on the team did. I just wanted to do my part," said Kleinubing. "When we took the checkered flag, I waited a little bit until Turn Four, then I asked ‘did we win the Championship?’ Maybe everyone pulled over and let [Saini] by! I wasn’t thinking about anything other than winning the race." "I’m thrilled for Pierre, this was a fantastic win, a truly remarkable way to end the season," said Cunningham. "I couldn’t be happier with this team right now. We knew what we had to do and we did it. We had to stay clean at the start and stay focused to the end, and here we are." Coming into the weekend, Acura trailed Mazda by the razor thin margin of one point in the Manufacturers’ race, but Kleinubing tied the score by earning the one point awarded for the pole. The team was optimistic that it might out-duel the Mazdas, but as previous season finales have shown, mayhem could be the standard for the race. In the Drivers’ points battle, Kleinubing and Cunningham entered the final round in what seemed like only a mathematical chance for the title, 54 and 80 points behind Mazda ace Jason Saini. After Kleinubing’s 15-point gain for the pole and Saini’s (no bonus points earned) eighth place qualifying effort, it suddenly became clear that Kleinubing had a legitimate shot at winning all the marbles. "Our primary goal was to secure the Championship for Acura; having Pierre take the Drivers’ Championship as well is icing on the cake," added Cunningham. Mosport winner Kuno Wittmer came to California sixth in points, looking to move up a position or two in the standings and assist in the charge for Acura. He proved once again to be a force to be reckoned with as he turned in impressive practice times and qualified for a fourth place start, adding to the heavy dominance of the RealTime team. However, after only six laps Wittmer was forced to retire the No. 44 Acura due to a rear hub failure. "We can’t always get what we want," said Wittmer, "but it’s hard to be disappointed when your team walks away with the spoils. All in all, it’s a good day." 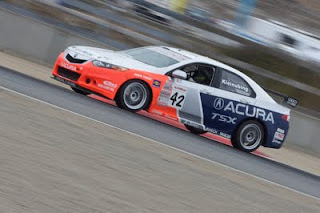 Former full time RealTime pilot Eric Curran also ran for the Acura RealTime team at Mazda Raceway Laguna Seca. Curran skillfully maneuvered the No. 45 TSX to an 11th place finish, gaining one position from his 12th place start. Also driving for the RTR team this weekend was SCCA Club Racing National Championship T3 Honda S2000 standout Sage Marie. Marie dove head first into the deep end of the pool in his pro racing debut. He impressed the team with his quickness in coming to grips with the No. 43 TSX and drove it to a 14th place result. Another accolade bestowed on the RealTime Acura team was "Crew of the Year." This honor was especially appreciated by everyone on the team because it is voted on by each of the other crews in the series. Kleinubing has now earned his fifth Drivers’ Championship with a total of 973 points, Saini came in second with 960 and defending champion Cunningham finished in third with 921. Acura won the Manufacturers’ Championship with 72 points, ahead of Mazda’s 65 and BMW’s 42. RealTime continued its rewriting of the record books in 2009 with its 12th Manufacturers’ and Drivers’ Championships. It was the primary contributor for four of Honda’s five SPEED World Challenge Touring Car titles (1993, ’94, ’95 and ’96) and all of Acura’s eight trophies (98, ’99, ’00, ’02, ’05, ’06, ’08 and ’09). Three different RealTime drivers have won championships in SPEED World Challenge GT and Touring Car competition: Peter Cunningham (1995, 1997[GT], ’02, ’06 and ’08), Michael Galati (’96 and ’98) and its newly crowned thirteen-year veteran Pierre Kleinubing (’97, ’99, ’00, ’05 and ’09). You will not want to miss this spectacular showdown. Catch all the racing action of the 2009 Touring Car Championship finale on Tuesday, November 3, at 2:00p EDT on the SPEED channel. The RealTime Acura team is sponsored by Acura, Acura Certified Pre-Owned Vehicles, Red Line Oil, Eibach Springs, Sparco, Hawk Performance, Brembo, A-SPEC, BOSCH, Total Auto Body, and PACT.